Just one day until Friday and then the weekend and I am more than ready. I am also more than ready to be today's stop on the TLC Book Tour for Glory Road, the new and third novel by Lauren K. Denton (a favorite of mine). Accompanying my review of this sweet Southern Alabama-set novel is a recipe for a sweet and homey Quick Peach and Pear Crumble with Cinnamon-Pecan Streusel, aka "The Dolly"--inspired by a dessert of the same name made by one of the characters. Once again, Jessie feels her protected and predictable life shifting. 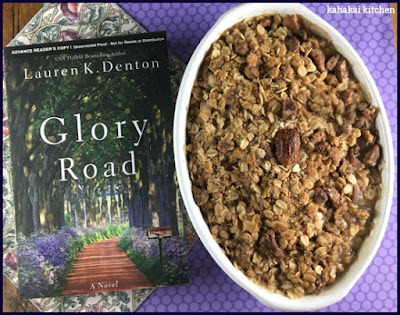 This is my third book tour with Lauren K. Denton books (see links my reviews/recipes for The Hideaway and Hurricane Road and she always draws me in with a gorgeous cover, tempts me with delicious-sounding southern food, and touches my heart with her engaging and endearing female characters. Glory Road is no exception with its three generations of strong, loving Southern women. Told from the points of view of Jessie, a single mother, back in her hometown after her husband cheats with his dental hygienist, her fourteen-year-old daughter, Evan, who witnessed the ending of her parents marriage when she was six, and her mother, Gus, widowed when Jessie was a teen and facing her senior years with memory lapses. Things are about to change for all three of these characters when Jessie's first love moves back to town with his teenage son and a local golf course designer/developer wants Jessie to expand her nursery business (charmingly called 'Twig') to include flowers for his daughter's wedding and shows personal interest in her too. 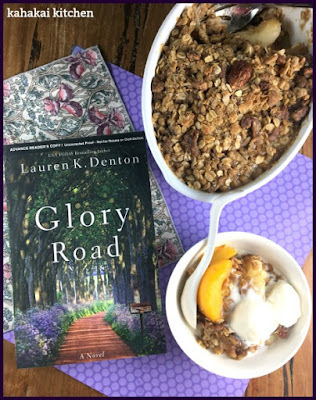 Author Notes: Born and raised in Mobile, Alabama, Lauren now lives with her husband and two daughters in Homewood, just outside Birmingham. In addition to her fiction, she writes a monthly newspaper column about life, faith, and how funny (and hard) it is to be a parent. On any given day, she’d rather be at the beach with her family and a stack of books. Her debut novel, THE HIDEAWAY, was a Wall Street Journal, USA Today, and Amazon Charts bestseller. Her second novel, HURRICANE SEASON, released in spring of 2018, is a USA Today bestseller. GLORY ROAD will release in March, 2019. 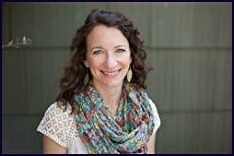 Connect with Lauren on her website, Facebook, Instagram or Twitter. 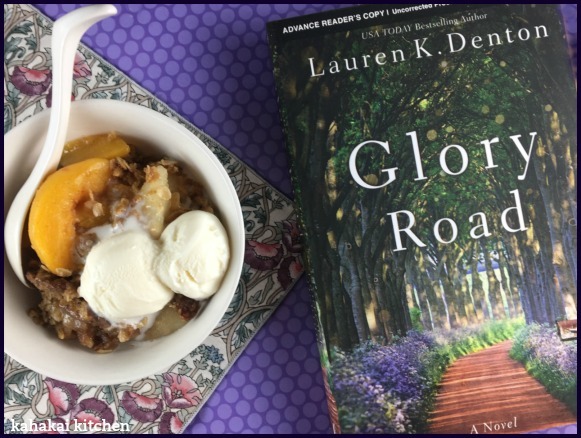 Lauren's books are always full of tempting food and usually some area favorites for her southern settings. Food mentions included: peas, peach cobbler, onion burgers, milkshakes, tomatoes, slushies, biscuits, friend eggs, peas--cooked so they were brown and almost creamy, cornbread, pound cake, popcorn, cereal, peanut butter, fried catfish, pecan trees, fried chicken, cornbread, fried green tomatoes, garden crops of sweet potato, cabbage, basil, and cucumber, pork chops with butter beans and green salad with cherry tomatoes, coffee, scrambled eggs, bacon and fluffy biscuits with grape jam, sizzling chicken, simmering soup, and fresh pie. a fried fig pie with cream cheese frosting, fresh strawberry iced tea, pancakes with lavender maple syrup, sugared pecans, chicken piccata, green beans, mac and cheese ("...it's a vegetable, you know..")and cornbread biscuits, apple pie, fresh apple jelly, peach galette, chocolate bourbon bread pudding, shrimp and angel hair pasta, Caesar salad, steak, thin crust pizza with mozzarella, greens and thinly sliced tomatoes, meatloaf, rice, sushi, shrimp and grits served in martini glasses or little glass jars, okra succotash, oatmeal and peanut butter cookies, "hunch punch" (grain alcohol mixed with fruit punch), root beer floats and pecan pie. For my book-inspired dish I had to go with something homey and baked in honor of Gus. She made lots of different baked goods, offering cobbler or pie with a purchase at Twig. 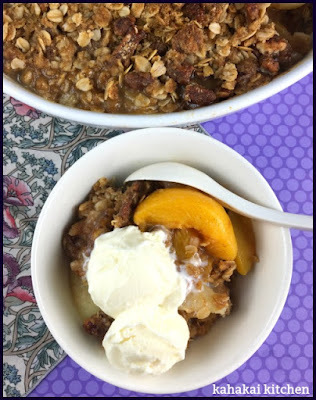 Two desserts in particular caught my eye because they had names; The June Cobbler--peach and blueberry with a pinch of cinnamon and nutmeg and My Dolly--peach and pear crumble with cinnamon-pecan streusel on top. I am a sucker for crumbles and crisps--more so than the more doughy cobblers and cinnamon-pecan streusel? Yes, please. My Dolly it is. I am all for fresh orchard fruit when it is in season, or home-canned which is likely what Gus used, but this being the beginning of spring and Hawaii, and a weeknight on top of that, I needed something easy and available. i bought canned peach and pear slices in syrup, planning to add plenty of cinnamon to the fruit as well as the topping to liven up my canned items. Place the drained fruit in a medium bow and squeeze the lemon juice over it. In a small whisk the flour into about 1/3 cup of the reserved fruit syrup until completely blended. Pour flour/juice mixture over soup and toss until well mixed. Place fruit into an even layer in a small oven dish or pan (I used a small oval casserole dish) and set aside. For the topping, mix flour, brown sugar, oats, cinnamon, salt, and chopped pecans into a mixing bowl. Add the pieces of butter to the bowl and use your fingers to work them into the dry mixture until it is the texture of course meal. Spoon topping evening over the fruit, packing down lightly. 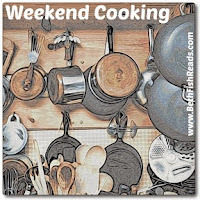 Place in the oven and bake at 350 degrees F. for about 30 minutes, or until the filling is bubbling up through the topping and the topping is golden-brown. If topping seem to be getting too dark/done, cover with foil and continue baking. Let crumble sit for about 15 to 20 minutes and serve warm with ice cream or half-and-half. Enjoy! 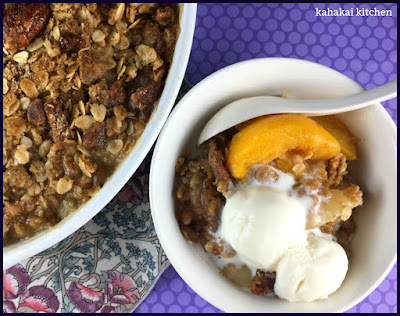 Notes/Results: I do believe that there would be fewer battles waged and less pain and strife in the world if only everyone could enjoy a bowl of warm fruit crumble with good vanilla ice cream. This one is plenty cinnamony and mighty good, even for canned fruit and you can't beat the speed and ease of being able to get this crumble quickly into the oven--making it good for unexpected guests or a long tough day at work. The topping with the bits of toasted pecan and the crumbly, oaty goodness, is delicious too. I took some leftovers to work for breakfast (fruit and oats, people!) ;-) and poured some cream from the fridge on top. Yum! I will happily make this again. 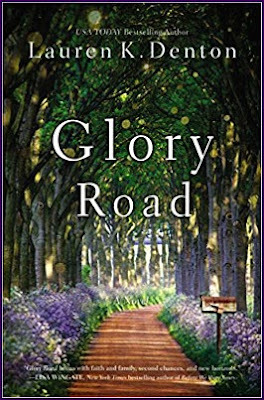 Note: A review copy of "Glory Road" was provided to me by the author and the publisher via TLC Book Tours. I was not compensated for this review and as always, my thoughts and opinions are my own. The crumble topping in your recipe is pretty much like the one I always use. I’ve never tried it with canned fruit, though — always use fresh fruit in season like peaches or apples or even rhubarb. That means we don’t have this dish very often! I like your philosophy of obtaining world peace. Crumble and ice cream for everyone! 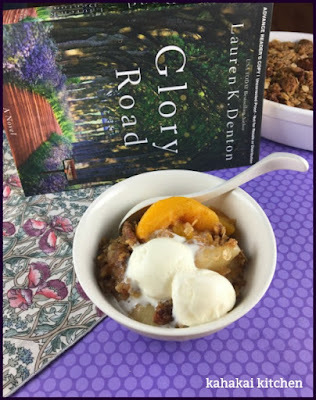 I almost missed the book review because fruit desserts -- especially crisps, crumbles, and so on -- are my weakness. Yummmm. Peach and pear crumble... yeah!